What Makes Bark City Different than Other Doggy Daycares? The vast majority of doggy daycare facilities place rigid restrictions on their guests, regardless of what the dogs actually want to do throughout the day. At Bark City, we take an entirely different approach, allowing our four-legged guests to spend the day exactly how they’d prefer—sleeping, playing, snacking or otherwise! Bark City also offers grooming services and a retail boutique store unlike anything else in the Manchester, NH area. 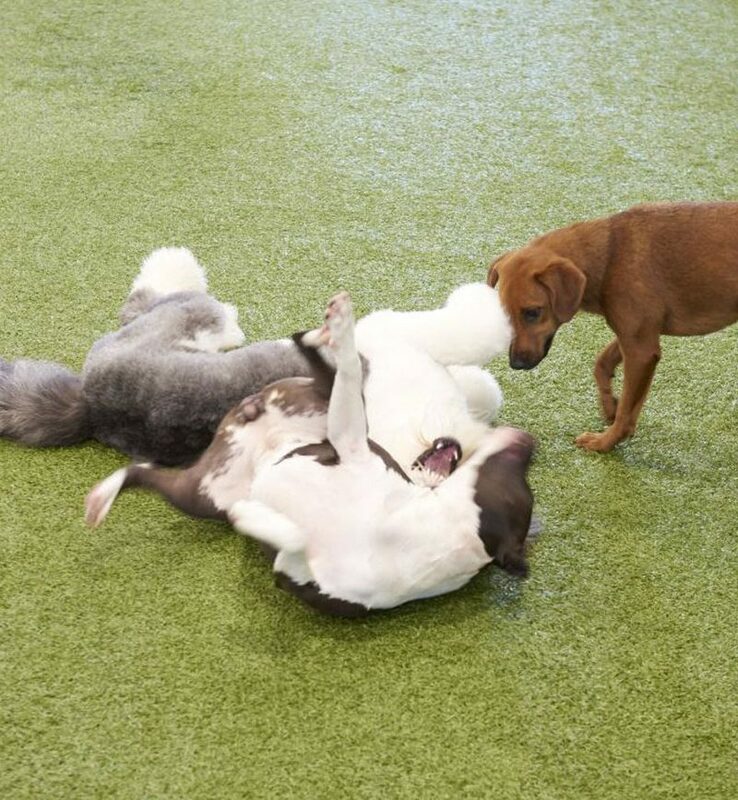 Bark City’s playroom is a cage-free, climate-controlled environment allowing dogs to roam and play as they please. Large windows let in plenty of natural light, and artificial grass flooring ensures a safe, easily-cleaned playing surface that doesn’t harbor bacteria. 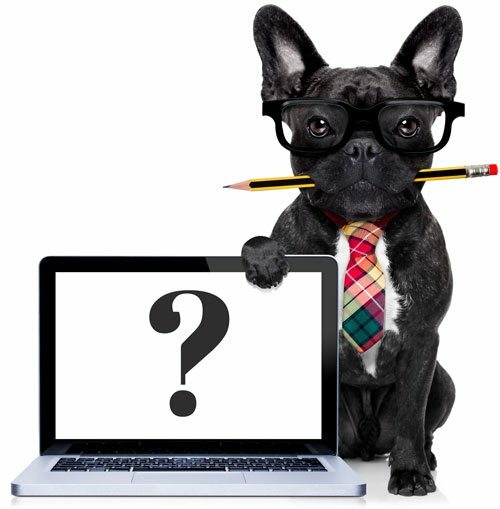 What Types of Dogs Will My Dog Interact With? The dogs who spend time at Bark City are of different sizes and breeds. Friendly dogs who enjoy a park environment and don’t stray from interaction with other dogs do particularly well in our play room. How do I Know if My Dog is Having Fun During the Day? Every dog who spends the day with us goes home with a daily “report card,” which describes how their day went, who they played with and a photo of your dog enjoying themselves. Owners can also monitor their dogs throughout the day via our webcams, which offer a real-time glimpse of your pup having a great time. We’re also more than happy to discuss your dog’s day with you, one-on-one, at time of pick-up to ensure expectations are lining up. What if My Dog Gets Hungry During the Day? The last thing we want is for one of our guests to spend their day hungry! We’re more than happy to feed your dog any meal that you’d like. The first meal is complimentary, 2 or more meals is subject to a feeding fee of $2 per day. Our guests can certainly work up an appetite as they play, so treats are also offered throughout the day—and are included in the price of daycare. Can I Bring My Dog’s Favorite Bed or Toy So They Can Have a Piece of Home at Daycare With Them? As possessive behavior can result from the presence of individualized items, we recommend these be left at home so as not to disrupt our well-functioning daycare environment. Bark City has plenty of toys and beds for your dog to enjoy throughout the day! Do I need a Reservation Prior to Bringing My Dog to Daycare? While reservations are not required, we get very busy and recommend our customers reserve a spot for their dog via the Gingr app. You’re also more than welcome to call us during regular business hours to make an appointment. Appointments are necessary for all salon services. Do You Charge a Fee if I Cancel My Reservation? There is no charge for canceling a reservation for daycare services, nor will a cancellation impact any package discounts. What is the Temperament Consultation? Bark City’s Initial Temperament Consultation (ITC) helps to ensure that your dog is a perfect fit for our daycare facility. They’ll start by meeting Daphne, our unofficial host (and French Bulldog) for some quality one-on-one time and to get to know each other. From there, your pup will be taken into a room with a small group of dogs for group observation. If no incidents occur, we’ll move into the main playroom for the final test. Once your canine has passed our assessment, they’re welcome to stay with us here at Bark City any day of the week! Do I Need to Make a Reservation for an Initial Temperament Consultation? In short, yes—it’s highly recommended that a reservation be made for your dog’s initial temperament test. Please call us or contact us online to schedule an appointment. Do I Need an Appointment for Salon Services? Appointments are necessary for all salon services. What types of dogs do best at Bark City? Friendly, social, non-aggressive dogs do best at Bark City. Our daycare provides a level of freedom and security that allows your dog to interact with dogs of all sizes and breeds. If your dog possesses one of the following groups of personality traits, he or she will most likely thrive in our daycare environment. The friendly and playful dog: Your dog loves to play with dogs of all sizes and happily changes their play style based on the size and number of dogs they are currently playing with. The relaxed dog: Your dog enjoys playtime, but he or she also likes their rest. The relaxed dog can do particularly well in our daycare environment because there will always be a group of dogs to relax and snuggle with. The little guy: Maybe your pup is not the biggest in the play yard and becomes intimidated when in a play group with a much larger dog. Bark City understands that while some small dogs enjoy playing with dogs larger than themselves, others certainly do not. That is why Bark City designates an area of our playground just for the little guys, no big dogs allowed! What types of dogs do not enjoy themselves at Bark City? If your dog possesses one of the following groups of personality traits, he or she may not be best suited for a day spent at our daycare. The predator: If you have a big dog that becomes aggressive in a play group with smaller dogs, your pup will most likely not do well in our daycare. At Bark City we want all dogs of all sizes to be safe and happy. Note that there is a difference between a large dog who is incapable of playing nicely with smaller dogs and a large dog who has never had the opportunity to play with smaller dogs. If your dog is the latter, our initial temperament consultation will determine their suitability to our daycare. The nervous guy: Some dogs can simply be overwhelmed by all that is happening in a daycare environment. The nervous guy enjoys hanging out on his own, but unlike the relaxed dog, would rather be alone than in the presence of other dogs. If you have a nervous guy, he or she may be most comfortable at home and would benefit from solo walks during the day. Who is not allowed at Bark City? Bark City does not place restrictions on breeds. All friendly dogs are welcome! Every dog at Bark City must be vaccinated for rabies, bordetella, and DHPP (distemper, hepatitis, parainfluenza, and parvovirus). All dogs 6 months and older must be spayed/neutered, or have an appointment to be spayed/neutered in the near future.